Overview (no spoilers): After being told by two different individuals to delve into the world of Mr. Reacher I decided to finally give him a shot. 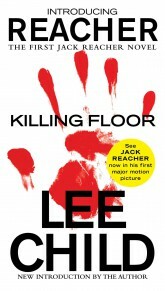 The perceptive and resourceful Jack Reacher makes his debut in the Killing Floor. Lee captures the reader in a web of suspense and mystery, just as Reacher, himself becomes tangled in a messy murder in a small, yet immaculate Georgia town. While Lee’s writing style creates a fog of suspense, the details he either purposely omits or adds in cuts through the murk revealing predictable plot points. Overall, the Killing Floor is an entertaining, quick page-turner without a lot of depth.